Home / Columnists/ New Year resolution: Attaining financial freedom in 2019! It is that time of the year when everyone, young and old is journaling their new-year resolutions, and reflecting on the past year. You might be disappointed if you are carrying forward a few resolutions from the past years. You could be thinking, what if you had a little bit more money in your bank account, or what if you had the job your friend or neighbour has, how it would have made you to feel accomplished. If you are looking for a way to get money to work for you and not be enslaved to the financial burdens, this article would give you an insight on how to manage your money to achieve your resolutions and not feel disappointed in December 2019. As the first step toward achieving your 2019 resolutions, I would encourage you to take on the resolution: “Invest in being financially literate”. ‘Finance’ is not a specialised knowledge that is only relevant to the finance professionals. Rather, it is common knowledge required by everyone who encounters money. That is, irrespective of your profession, age, gender or marital status, all of us need to know how to interact with money, just like how we would acquire skills to socialise with people and get our daily tasks accomplished. We were taught how to behave; at a school, at a religious place, at a business meeting, etc. But, is there anywhere we learn how to behave with our money? For most of us the answer would be ‘no’, because we learnt about money through trial and error. In the rest of the article we will discuss how to attain ‘Financial Freedom’ by looking at what is financial literacy, its importance and ways to achieve it. ‘Financial literacy’ is a phrase that has been appearing on media recently. But, what does it mean to be financially literate? According to commonly accepted definitions of financial literacy, an individual who is financially literate would be able to; read, analyse, manage and communicate about personal financial conditions; recognise financial choices; plan for the future; respond competently to life events that affect every-day financial decisions and changes in the economy. Therefore, financial literacy is of mainly two facets, ‘gaining financial knowledge’ and ‘learning a way of living or a lifestyle’. One without the other will not make an individual financially literate. Ability to understand financial decisions and financial choices could be achieved by gaining knowledge related to the basic financial concepts (interest, inflation and risk management). Financial literacy is of mainly two categories. "Gaining financial knowledge" and a "lifestyle." On the other hand, planning for future needs, and making appropriate financial decisions on every-day life events and economic conditions are influenced by an individual’s behaviour patterns, as these are a way of living (i.e. lifestyle) one needs to be chosen to follow. Just like our decisions and viewpoints on different life events are influenced by us and our upbringing, financial decisions and behaviours are affected by both, the level of financial knowledge one has on financial concepts and how well one practice what they know about money. How do you achieve your new-year resolution of being financially literate? Financial literacy as explained before encompasses both ‘Knowledge’ and ‘Lifestyle’. Therefore, in order to be financially literate one would require to obtain knowledge about financial concepts through formal education programs such as; schools, employer sponsored workshops and financial counselling. Due to the dynamic nature of the economy and developments in the field of finance not only do we need to include financial literacy in to our school curriculum but also, encourage workshops for adults, which would encourage continuous learning about the developments in the world of finance and the economy. Knowledge alone will not ensure a behavioural change in an individual. It takes a lot of practice. As one of the old saying says, “Practice makes you perfect”, you got to put your financial knowledge in to continuous practice and embrace it as a lifestyle in order to be financially literate. Teaching about ‘Money’ to your children! We often overlook the contributions the family makes towards influencing behaviour of an individual. Every one of us have a role model in our lives, and most often than not parents become our role models. This is because parents are involved in laying the foundation of shaping our behaviour. From simple acts such as the way we hold the pencil to how we behave at the dinner table and how we respond to situation in our work places and families. The parents play a key role in shaping the value systems of their children. Therefore, when children are encountered with a decision, the thought process that leads to the decision is affected by their up brining. Financial decisions are one of the most common decisions one would require to make in life. But, most of us are not socialised in to understanding what money is, how to behave around money, and how not to fall in to financial traps such as, impulse buying and marketing tricks. Our family systems play an important role in shaping the behaviour of the young in appropriate financial behaviours just like it instils moral values and beliefs. In a future article we will look in to how to teach about money to your children. ‘Money’ is not a taboo topic to be discussed with your children, rather, it is one of the important life skills parents could impart to their children. Being financially illiterate will have immediate consequences on an individual’s financial situation. But, we forget the ripple effect unfavourable financial situation will have on the employers and the greater economy. Today’s employers are faced with the problem of high staff turnover. Employers often experience employees switching jobs even for insignificant increments in employment benefits. Staff turnover comes at a cost to the employer. These costs involve (but not limited to) the cost of new recruitment, loss of internally generated knowledge, bottle necks in the process during the transition period, reduced employee morale, flow of skill and knowledge to competitors, etc. and many more. Additionally, employers today also face a higher number of requests for staff loans and salary advances, which not only require a high administrative capacity, but also affect the bottom line of the company. Most employers fail to identify the root cause of the problem, keeping most companies away from providing a sustainable solution that will regain the company performance. Just like the golden rule in Human Resources says to ‘train’ your staff in the job related skills in order to retain them, I would encourage the employers to ‘train’ your employees in finance by investing in providing knowledge of finance to your employees. 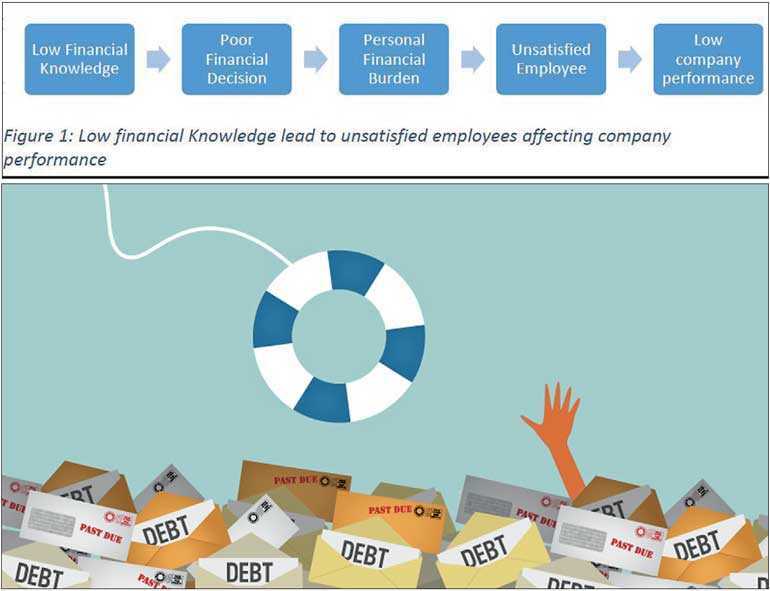 This will put both the employers and employees in a win-win situation, where the employee is freed from ‘financial burden’ through better management of their personal financial situations, and the employer is provided with a satisfied work force which pave the way to overcome employee related problems and be on track to achieve company goals. Poor financial decisions will have a ripple effect on the economy at large. For example, in the past, scandals in finance companies which ended in bankruptcy were made possible because the depositors of these institutions failed to conduct fact check and test financial principles on justification of high interest rates. In these situations not only did the individuals lose money, the entire financial system was at risk of instability, insecurity and lack of trust in the financial system at large. Today we see that lack of knowledge in finance concepts have a much far-reaching impact on our country’s financial and economic development. One such example is, how each political party is seen providing election promises of various subsidies, and now it has become a competition to provide the best package of subsidies to win an election. But, as a nation we do not understand that these subsidies comes at the cost of government debt, which has currently risen to an extent that it will take multiple generations to pay off. Therefore, it is in my opinion that we as individuals, groups of individuals and as a nation is required to invest in Financial Education. Financial education not only provide personal benefits, it has an impact on enrich the experiences we create for ourselves and for our families, it will increase productivity and profitability of our economy and enable to break the vicious cycle of poverty as a nation in the long run.